Pro Tools can integrate external hardware into its mixer, and even compensate for the delay that this introduces. 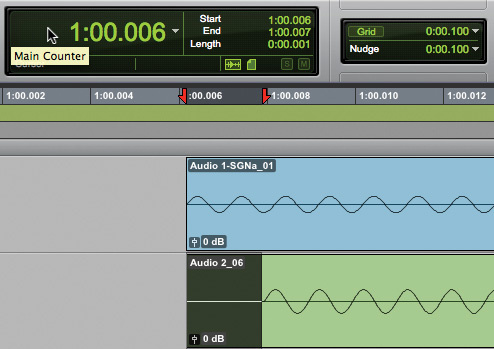 In this month's workshop, we'll be exploring two areas of Pro Tools that are often overlooked. The first of these is its ability to integrate external hardware processors as inserts in the mixer, and the second is the Universe view — which has developed extensively in recent versions, and which I have just discovered after many years of disregarding it. Although most of us are doing more and more 'in the box' these days, using plug-ins for processing, there are still occasions where using a hardware processor is the way forward, either because there isn't a plug-in equivalent or because the hardware just sounds better. We have had delay compensation for plug-ins for a while now, and the good news is that this can still be employed when you're using your interface to route audio out to a hardware processor and back. You can specify a separate delay value in milliseconds for each external device you use in the H/W Insert Delay tab of the I/O Setup window, and these times will then be used by the delay compensation engine to time-align the paths when the hardware insert is in use and Delay Compensation is enabled. What's more, Pro Tools will only apply these delay offsets when the I/O is being used for hardware inserts. The six million dollar question is how you know what value to set for each device. How many milliseconds does the audio take to do the round trip out through the interface, through the hardware processor, back through the interface and into Pro Tools? The first and last sections of that journey will be the same in every case, because they are down to your interface setup, and Pro Tools will compensate for them automatically. However, some outboard units — including all digital devices — add a latency of their own, which needs to be compensated for. The best way to do so is to measure the round-trip latency yourself, and Pro Tools will help you do this. Before you start, make sure that Automatic Delay Compensation is on: from the Options menu, select Delay Compensation and choose Short, Long or Maximum. Make sure your Session's Main Time Scale is set to Min:Sec. Create two mono audio tracks and record a short section of tone on the first. The way I do this is to highlight a 50ms section of the track, select Signal Generator from the AudioSuite menu and hit Render — but you could use any audio sample, as long as you can clearly identify the start of the audio. Add a hardware insert on this track. This is done by clicking on the insert slot and selecting I/O rather than a plug-in. In the first screenshot, I used input and output 5, so 'A5' is what is displayed Here, I'm preparing to measure the delay caused by the hardware insert ('A5') on the left track, by recording its output to the right track. . Ensure that only the dry signal is being passed through the hardware processor, but don't put it into a true bypass mode, as the audio needs to go through the full chain. So in the case of a reverb or delay, setting the output to 100 percent dry will ensure that the audio passes through the processor, but the effect won't mess up the test measurement. In the case of a compressor, set the controls so that it doesn't compress, and for an EQ, set the controls flat. After recording, zoom in and measure the difference between where the audio starts in the two tracks. I measure the offset by placing the cursor at the start of the audio waveform on the second track and then using the keyboard shortcut Alt-Shift-Tab. This will take the cursor back to the beginning of the region, in effect selecting the offset between the starts of the two clips. The selected area represents the time difference between the two clips and hence the delay introduced by the insert processing on the first track. You can then read off the length of this selection, which represents the delay introduced by whatever hardware device is connected to your insert. However, when dealing with very small delays, be aware that the timeline display doesn't show time increments smaller than 1ms, even though you can enter fractions of a millisecond in the H/W Insert Delay window. Once you've figured out the delay and entered it, the delay compensation engine will compensate for the latency of the external processor as well as the round trip out and back through a hardware insert point, and you can use your favourite hardware processor in your Pro Tools Session without having to be constantly moving clips back and forward to compensate for the round-trip delay. One possible application for this is to use some of the really cheap but very powerful apps that are coming onto the market for smartphones and tablets. You need to have an audio interface of some kind for your smartphone or tablet, but then you can use the apps to process your audio, making full use of the touchscreen interfaces that can bring some of those effects to life. Clicking and dragging the highlighted box around the Universe window is a very easy way of navigating a large Session. The Universe view displays an overview of the entire Pro Tools Session above the tracks pane in the Edit window. I must admit that until very recently I never used it, as I felt it took up valuable screen space, especially on single-screen systems. However, this is becoming less of an issue on today's larger displays, and I am now finding the Universe view really useful, especially when navigating around large Sessions. The Universe view can be displayed by selecting Universe in Other Displays, by double-clicking the black divider above the main timebase ruler, selecting Universe from the Edit window pop-up menu, or clicking the Show/Hide Universe view button. This overview represents audio and MIDI material on all tracks in the Session that are not hidden, including tracks that are inactive, or contain offline clips. It displays them all in the same order as you will see them in the main Edit window. The tracks are represented by horizontal lines that are the same colour as the clips on the tracks, and tracks are displayed at the same height regardless of how many channels they have. The framed area or highlighted box within the Universe view shows what is visible in the Tracks section of the Edit window. So if you change what is displayed in the Edit window by zooming, scrolling horizontally or vertically, hiding or showing tracks, or changing track heights, the framed area in the Universe view relocates and resizes accordingly. But the highlighted box isn't just a display of what you can see in the track section of the Edit window: it also jumps to any point you click within the Universe view, and the main Edit window will follow. Alternatively, you can drag the highlighted box around the Universe view and very quickly get to the appropriate part of your Session. You can resize the height of the Universe view to fit the total number of tracks in the Session, or to show more or less of the Edit window, by clicking and dragging the border between the bottom of the Universe window and the top of the Timebase rulers. If you have more tracks in the Session than are visible in the Universe view, you can scroll up or down to show the other tracks, and a mouse scroll-wheel can also be used to navigate the Universe view. I have found that this makes navigating large Pro Tools Sessions much easier, and I wish I'd discovered it before!